April 3, 2018 - Reno, NV - NuLegacy Gold Corporation is pleased to report the appointment of Mr. John P.A. Budreski to its board of directors. Mr. Budreski, MBA/BEng. has over 35 years of extensive capital markets and executive management experience and is the Chief Executive Officer of Morien Resources Corporation. He is also Executive Chairman of EnWave Corporation, a leading dehydration technology company. “We welcome Mr. Budreski to the board”, commented NuLegacy Chairman Albert Matter, “as he has a professional history of rapidly advancing and accelerating businesses to success, as well as tangible engineering experience”. In addition to Morien and EnWave, Mr. Budreski is currently a Director of Sandstorm Gold Ltd., and Input Capital Corp. John was formerly Vice Chairman of Cormark Securities Inc. from 2009 to 2012 and President and CEO of Orion Securities Inc. from 2005 to 2007, prior to its successful sale to Macquarie Bank. He was Managing Director of Equity Capital Markets and Head of Investment Banking for Scotia Capital Inc. from March 1998 to February 2005. He also held senior roles in investment banking, equity sales and trading for RBC Dominion Securities. 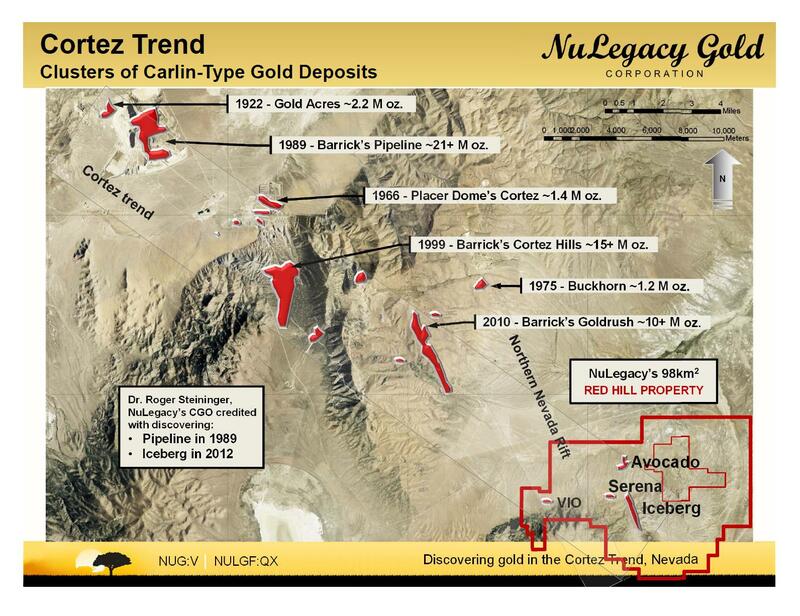 NuLegacy’s Red Hill Project is located on trend and adjacentii to the three multi-million ounce Carlin-type gold deposits (the Pipeline, Cortez Hills and Goldrush deposits) that are amongst Barrick Gold’s largest, lowest cost and politically safest gold minesii.